There are a number of ways to support Voices Against Injustice. In addition to providing a donation or becoming more informed about issues relating to human rights and social justice, you (anyone!) can become a Friend of VAI. Suggest creative ways to interact with tourists visiting the Memorial; providing them with a deeper, more meaningful experience. 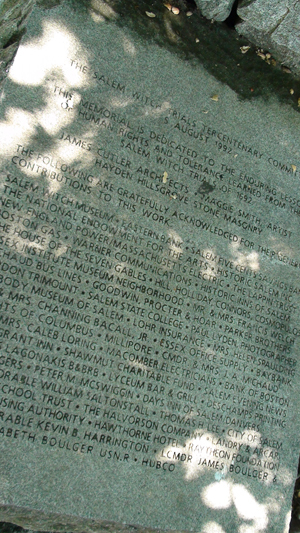 Donate and help to maintain the Salem Witch Trial Memorial. Submit and encourage others to submit applications for the annual award. Present ideas for lectures, symposia related to human rights and social justice. Assist in the identification of descendants of the Salem Witch Trial victims. Donate : We are always grateful for donations of any size. Assist in fundraising efforts through connecting VAI with potential resources.